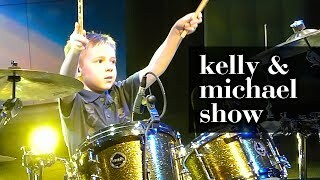 Avery Molek (7 year old drummer) Solo and Interview on KDKA TV, Pittsburgh Today. Promo for the Hungry Hearts show on May 30, 2014 at the Pittsburgh Hard Rock Cafe. 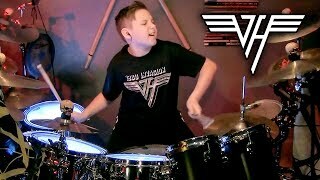 "Q&A with Avery "Drummer" Molek"
Thanks to everyone on YouTube & Facebook for your question submissions. Sorry that I could not get all the questions in, there were a ton. Avery Molek, Dave Wells (drummer of Hungry Hearts) and Roy Martin-Smith of the Hard Rock Cafe on Pittsburgh Today. Promo for the Hungry Hearts show on May 30, 2014 at the Pittsburgh Hard Rock Cafe. 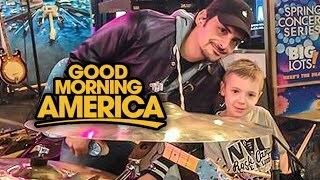 January 20, 2014 Avery Molek's Interview & Solo on Australia's Sunrise Show, Live remote from Pittsburgh, PA, USA. Thank You everyone at Sunrise!!! Interview was for my viral video "Hot For Teacher". My first ever radio interview. Interview was for his viral video "Hot For Teacher".